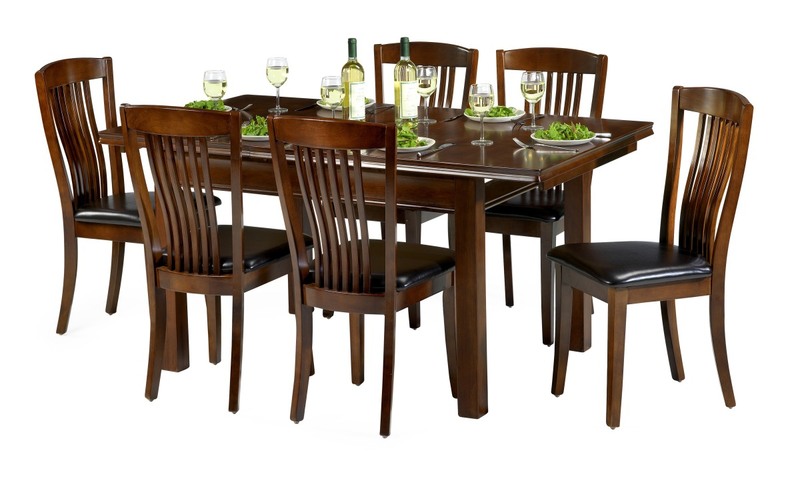 It’s best to get the largest size table for the space that will comfortably accommodate your family for regular meals. There’s nothing worse than sitting at a table that is too big or too small for everyday comfort. Extensions should be used for additional guests at special occasions such as family get-togethers or holiday meals. Proportion is very important in design. You don’t want your table to look like it’s lost in the room or look like the table is wall to wall. Start by measuring the space the table will be sitting in, if you already have other furniture in the area like a buffet and butch, sideboard or an island only measure the space where the table will sit, wall to wall, wall to sideboard etc. Allow for a 2 foot perimeter all the way around the table, which is the absolute minimum you’ll require for comfort without being squished in your chair. Two feet will give you enough room to pull out your chair, get in front of it, and sit down. It’s always better if you can get more than 2 feet around the table. Remember to allow for more space if you plan on getting extensions. Tables can be expanded by using either centre leaves or end extensions. Centre leaves are typically 12” and tables will be designed to accommodate between 2-4 centre extensions. End extensions are typically 18” and having one at each end will allow you to sit an additional four guests at the table. If you’re upgrading to a larger table for your space a good way to measure is to place a piece of cardboard cut to the new, larger size on top of your existing table, walk around the table and test that you still have a minimum of 2 feet around the table. If you don’t have a table in the room, then use masking or painters’ tape to outline the table, using your ceiling light to centre the outline. Remember to leave enough space for potential storage units, which are typically 19” deep. The number of chairs you can get around the table depends on the width chair itself. Typically a person will need 18-24” of linear space. The more elbow space per person the more comfortable they will be. 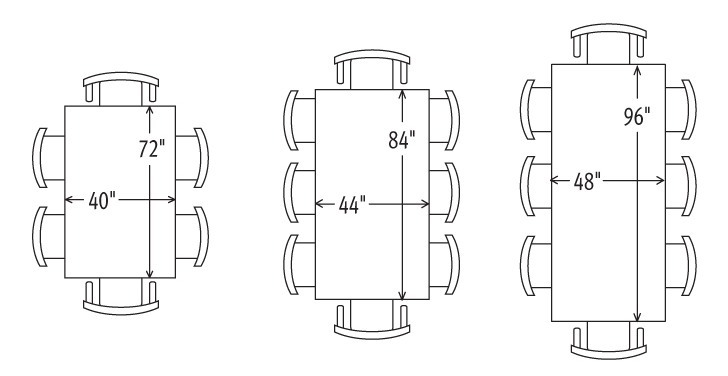 As a general rule, a 60” table will seat six (two on each side and one on each end), and then add an additional seat along the side for every additional 24” increment. For round tables, a 42” round table will seat four comfortably and every 6” increase in diameter will allow you to seat 1-2 additional guests.